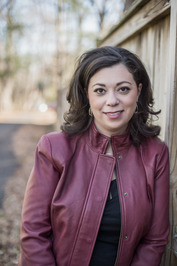 Welcome back to Alexis from I'M MAD FOR BOOKS, LUV and mine monthly book tag. Every month we thought it would be fun to come up with a theme and to go along with that chosen theme, a tag. However it wouldn't be just your average tag, the questions would relate to books which in the end will also relate back to our theme for that month. So I guess you could call it a book tag. We welcome anyone to join. If you do participate, we ask that you notify one of us via My Twitter or Alexis's Twitter, or by commenting on either of our posts with the link to how you did this book tag. In doing so it allows us to add the link to your book tag to that months book tag post on our blogs. We also ask that you somehow link back to us as well. 1. 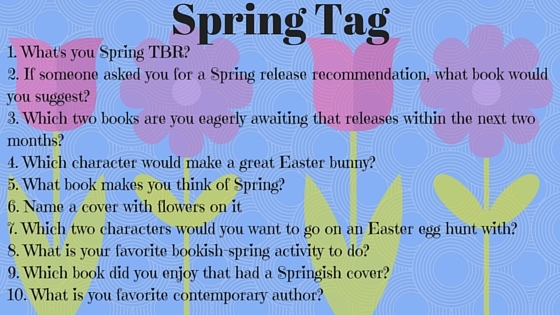 What is your Spring TBR? 2. If someone asked you for a Spring release recommendation, what book would you suggest? 3. Which two books are you eagerly awaiting that releases within the next two months? 4. Which character would make a great Easter bunny? Can I say Aldrik from the Air Awakens series? OH MY GOD, can we just take a moment to all picture the Crown Prince Aldrik in a bunny suit. What about Jax in a bunny suit? Or Baldair? WAIT I figured out my answer, Fritz. I choose Fritz to be the Easter Bunny. 5. What book makes you think of Spring? Rain by AmandaSun. The Spring time always reminds me of raining and all the fun stuff. Air Awakens by Elise Kova.. It has all those roses..such pretty roses. 7. Which two characters would you want to go on an Easter egg hunt with? Bastien from Thief of Lies by Brenda Drake, and Elecia from the Air Awakens series by Elise Kova. I think these two would make excellent hunters. 8. What is your favorite bookish-spring activity to do? 9. Which book did you enjoy that had a Springish cover? I actually couldn’t think of one, but maybe you guys can leave suggestions in the comments for a spring orientated cover. 10.What is your favorite contemporary author? My go to genre is Fantasy and sci-fi, I don’t read much contemporary but a recent author would be Emery Lord. Hahah Jax & Aldrik with a bunny custome. I would pay a ton to see that. And yeah, Elecia would make a great Easter egg hunter. Right?!! I think we just thought of a fun little fanfic Elise could write ^_^. I can't wait to see your tag go up! First "Blogger of the Month"